Steak and mushrooms are always a winning combination. 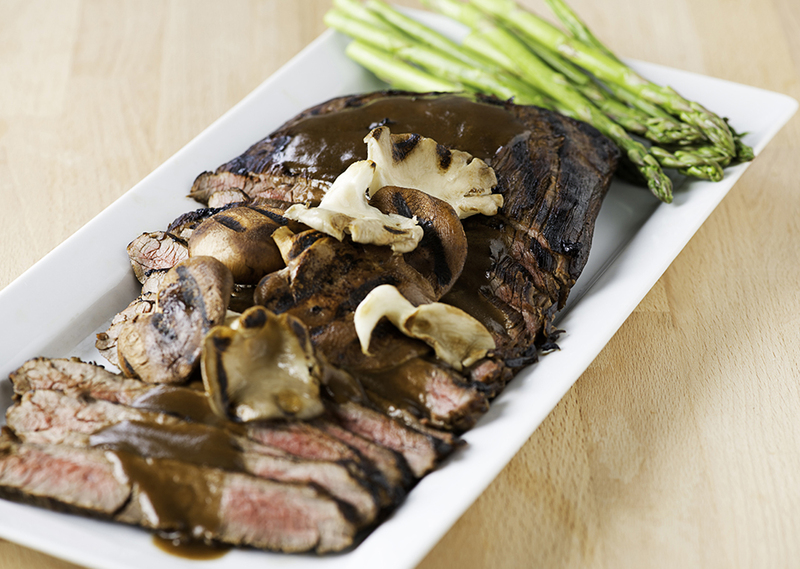 Marinating the flank steak in balsamic vinegar adds an unforgettable rich sweet flavor. For the mixed mushrooms, try baby Portobello, shiitake, Cremini and oyster mushrooms. Stir vinegar with soy sauce, Worcestershire sauce and honey. Add flank steak and marinade to a resalable bag. Marinate, refrigerated, for at least 1 hour, and up to 24 hours. Preheat George Foreman Grill for 5 minutes with lid closed. Remove steak from marinade and reserve. Season steak with 1/2 tsp salt and 1/4 tsp pepper. Place steak on grill, cook for 6 to 8 minutes or until internal temperature reaches 145°F for medium rare. Tent with foil and let rest for 10 minutes before slicing. Transfer marinade to a small saucepan set over medium heat; bring to a boil for 1 minute and cook until thick and syrupy. Meanwhile, toss mushrooms with thyme, garlic and the remaining salt and pepper. Place on grill and cook for 3 to 5 minutes or until grill marked and tender. Thinly slice steak across the grain. Drizzle with cooked marinade. Top with mushrooms. Tip: Serve on a bed of lightly dressed arugula, if desired. For the evolve grill, preheat grill to 375° and cook for 5-7 minutes depending on your desired doneness. For the Indoor|Outdoor grill, preheat the grill to Setting 3 and grill covered for 7 minutes.